I will raise up for them a prophet like you from among their brothers; I will put my words in his mouth, and he will tell them everything I command him [Deut.18:18 NIV]. A considerate look at the overall context of this ‘prophecy’ reveals the erroneousness of both Muslims and Christians in their respective propositions. Muslims in general point to the prophetic mission of Muhammad[p] as the ideal referent, while, most Christians have always associated it with and viewed Christ[p] as fulfillment of yet another Old Testament prophecy. In negation of my previous view, which was admittedly borne out of Muslim favoritism, I now suggest this passage concerns not a certain individual with particularity. Its immediate context, starting from v.9, points to the office of prophethood in general. Israel is admonished against turning to diviners and wizards who indulge abominable practices for supernatural commune and future foretelling [vv.9-14], hence receive assurance, out of personal request, of a continuous chain of prophets who, like Moses[p], would communicate unto them divine directives [v.15ff]. If the promise were pertaining a particular individual, the overall context would seem incoherent. The use of singular pronouns are actually collective singulars as in Isaian Servant songs [cf. v.22], and Deut.34:10 need not be seen as any hindrance either, since it magnifies Moses'[p] un-parallel dignity and status among Israelite prophets, whereas our passage merely concerns prophetic function [Ex.19:16-19]. Most crucially, this ‘prophecy’ could not be concerning Christ[p] since the very idea of a savior messiah was not yet formulated, coming to fore during the post-exile period. Jesus[p] himself never cited it in self-designation, remarkable considering Jesus[p] feels at home using, of frequency, his other messianic titles. Jn.1:45, 6:14, Act.3:22, 7:37 are confronted by Jn.1:19-21 and 7:40-41, and may well be described as devout zealousness. Neither does the Quran make any claim thereto, despite stressing the Prophet[p] being mentioned by name in the Bible. Q.73:15-17 merely stresses similar outcome of Meccan disbelievers as that of Pharaoh’s legions afore. Deut.17:15, which arguably shows the passage concerns Israelites alone, is enough in miscarrying the Muslim misconception. Moreover, this ‘prophecy’ is no prophecy, rather, annunciation of God’s future scheme regarding the station of prophethood within Israel in compliance with her wish [Ex.20:18-21]. It is well-known that before Moses[p], prophets were appointed few and far between. The declaration concerns commencement of an un-broken succession of prophets among Israelites after Moses[p] [Q.2:87]. Hence, no particular individual is alluded here. The best inference one could achieve is an implicit one; that, since prophethood is the subject-matter and Jesus[p] is one of, if not the greatest, prophet in Israelite religious history, he more than anyone is here referenced. Yet any such deduction is naturally secondary and un-told in the text’s primary intent. 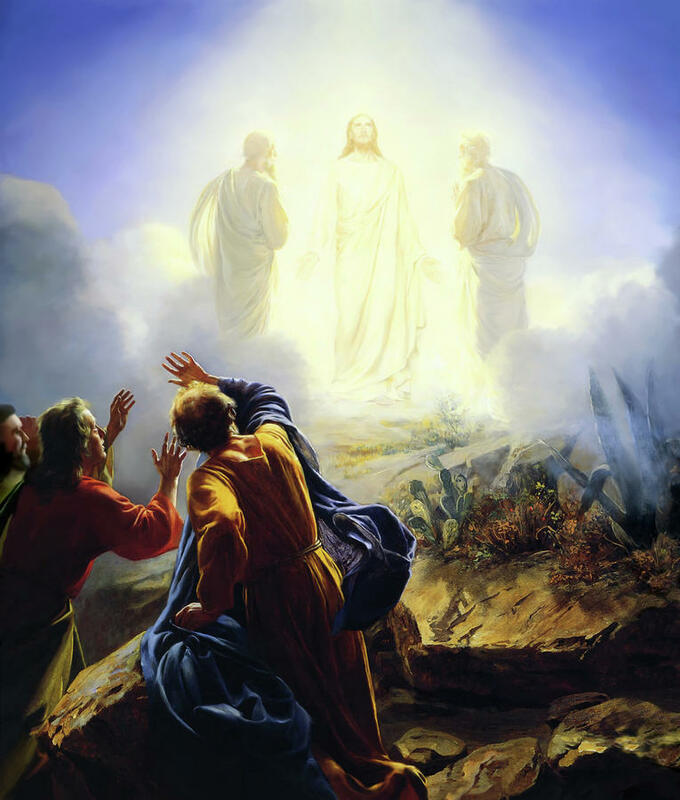 An Islamized exposition of the Transfiguration narrative. Verily all praise and gratitude is for God, and may He shower mercy and blessing upon His final Messenger Muhammad! I haven’t seen the film, neither do I have any such plans, for only the wicked of mind go in pursuit of profanity. Based on what I’ve learned from hearsay, a bunch of individuals claiming orthodox Christian belief have made another vain and futile attempt to defame the holy name of a Prophet whose lovers number among the stars of heaven, who is without dispute the most revered person mankind has ever produced; Muhammad, the Messenger and Servant of God, on whom be peace and blessing. One who calls Jesus, on whom be peace and blessing, his nearest brother and recited glorious verses of the Qur’an which carry nothing save reverence and love for Christ[p]. It is to me of great disgust that factions in the west affiliating themselves with Christ[p] whose teaching founds on love and honor would replicate Zionists of all people; for if slanders of such magnitude came out of Jewish minds then it made some sense; since their history is polluted with long and un-ending nauseous behavior. But Christians, the fore-fathers of whom have themselves been victim of abuse and knowing Christ[p] – whom they proclaim “Son of God” – suffered deep wounds through the sword of verbal assault are the last people you expect would emulate hobbies of Scribes and Pharisees. The point being communicated is that if you to any extent condone these successive shameless attempts that are nothing but despicable manifestations of pure hatred and schemed to instigate violence for reasons obviously other than religion and the will of God then would you also allow for those Israelite abuse and allegations wrought up against Jesus[p] and his noble mother[p] under the same banner of free speech? If that be so then you’re no better than the Pharisees and Scribes, and if not then you’re still as double-standard and hypocritical as they. The people of wadi al-hijr also rejected Our Messengers: we gave them Our signs but they turned their back on them. They carved out dwellings in the mountains and lived in security [or so they thought before] the blast (of our punishment) overtook them early one morning. All that they had acquired was of no avail to them. We have created the heavens and the earth and all that is between the two in accordance with the requirements of truth and wisdom. The Hour is surely coming, so ignore and overlook [their faults] with gracious forgiveness. Surely your Lord is the All Knowing Creator! We have given you the seven oft-recited verses and the great Qur’an. Do not strain your eyes towards the worldly benefits We have bestowed on some of them, nor grieve on their account. Lower your wing of mercy for the believers and say, “I am, indeed, a plain warner”, such as We send down for those who are divisive and who have broken the Scripture into fragments – by your Lord, We shall question them all about whatever they had been doing! Proclaim openly what you are commanded, and avoid the polytheists. We will, surely, suffice you against those who mock, who set up another god with God, but they shall soon learn. We do indeed know how your heart is distressed at what they say. So [as a remedy] glorify your Lord with His praise, and prostrate yourself: and worship your Lord until what is certain [death] comes to you [Al-Qur’an 15:80-99]. What follows is a minor attempt of assimilating the famous ‘Lord’s Prayer’ with Islam. Though the Prayer requires no incorporating and is very much part of Islamic teachings (if not tradition), the need was there to convey that Muslims not only own the ‘Lord’s Prayer’; it’s message very much expresses the essence of Islam. This short article is edited by me (6sman), the original source can be found here written by brother Joan Booso to whom I’m very thankful.